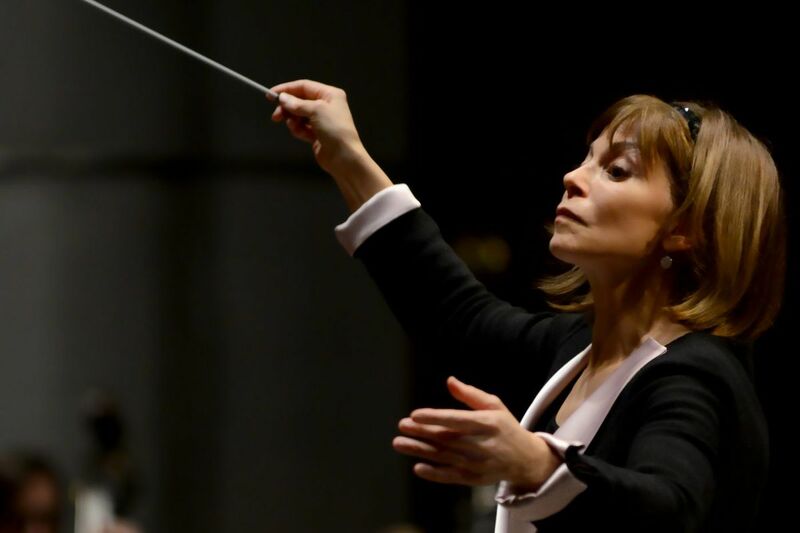 Are women on the verge of big progress on the conductor's podium? Patiently, earnestly, female conductors have been waiting their turn. Once in a while, a woman will make the rounds on podiums and get touted as the one who might finally break through to a big career heading a major orchestra or opera company. And, in fact, there has been progress; Marin Alsop has been music director of the Baltimore Symphony Orchestra for more than a decade. But if change has been slow, the pace appears to be picking up with the arrival of a new crop of female conductors. Mirga Gražinyte-Tyla, Emmanuelle Haïm, Jane Glover, Nathalie Stutzmann, Karina Canellakis, Susanna Mälkki, Xian Zhang, and several others are getting high-profile guest work, though not necessarily big posts. Are female conductors finally arriving? "I think they are, and, in some ways, it happened suddenly," says JoAnn Falletta, music director of the Buffalo Philharmonic Orchestra. "For some of us for years we were thinking that it would just open up gradually and be a crescendo of women appearing. But it seemed to be stalled for a bit and not making much progress. Of course, it has to be an organic progress. But now it seems that orchestras are open to looking at women, at young women, at young conductors in general. It's a time when people are saying, 'Maybe we can change the way we think about programming and, hopefully, presentation.' And it's not as if women are not ready. All of these decades women have been studying, filling spots in smaller orchestras, and the women stepping into these roles come from solid backgrounds." Falletta should know. Though she heads an orchestra not immediately thought of as one of America's most visible, she is making important artistic statements and may end up being the tortoise in a profession still very much taken with hares. Falletta has often led concerts in Philadelphia and visited major orchestras, and although she has no performances here in her immediate datebook, she is making her impact through other channels. She has a big presence on radio. Tune in to the middle of an impressive but unknown piece, or happen upon a familiar work with a problematic passage resolved, and these days it often turns out to be a performance by Falletta. By sheer numbers, the chance of encountering her recordings is high. She is recording two or three times a year with the Buffalo Philharmonic, through Naxos as well as on Beau Fleuve, the orchestra's own label, and has recently notched 100 recordings. "I'm interested in taking a piece that doesn't play itself and really making it shine," says Falletta, 63, who studied conducting at Juilliard and who has two degrees from the school. "My charge is music of the late 19th century and early 20th century that is not well known. It suits the Buffalo Philharmonic, that late Romantic period, and it's been a fantastic voyage of discovery. We've discovered music that never would have been played." It not only suits the orchestra, she says, but the practice of constantly recording has sharpened the ensemble. "You listen when you record, you listen differently, with much more focus and much more attention to detail," she says. "You identify all those treacherous spots of ensemble difficulties or balance difficulties, and the orchestra found that it then listened that way all the time, because they developed that keen sense of awareness, especially because this music wasn't something they had done 25 times before in their career." The striking thing about Falletta's area of concentration is how amiable the music is that stands behind unfamiliar names: Vítězslav Novák's obvious musical relative is Dvořák, with whom he studied, but his music has greater sweep and mystery. Victor Herbert is outed as a composer of much greater substance in a disc of his cello concertos than his Babes in Toyland fans and critics might suspect. She has championed the quite original but obscure voice of Austrian Marcel Tyberg, who died in Auschwitz, with recordings of his second and third symphonies. Philadelphia was reminded of its own compositional lineage with a disc of works by Romeo Cascarino — recorded by Falletta with Philadelphia freelance musicians — whose Blades of Grass for English horn, harp, and strings is a noble and restorative deep sigh written in the aftermath of World War II. Falletta also has recorded quite a bit of standard repertoire. But taken as a whole, the familiar side by side with the obscure, her catalog dissolves the notion that there is a bold line between composers widely accepted as great and those who, for one reason or another, never made it into the club. Which brings up another club: "The presence of women composers on symphonic programs is still so small," she says, adding that she relishes in such repertoire an opportunity that perhaps does not come with other works. "How does one approach a piece that no one knows and no one has played? It's like waiting for a book to be opened that's never been opened before, and that has kept my interest in these lesser-known pieces keen." Falletta once assembled a program at the Virginia Symphony Orchestra, where she has been music director for more than two-and-a-half decades, of five or six pieces by women of the past, "and it was one of the most popular programs we'd ever done," she said. But generally, she likes to mix works by women into programs with more standard works. This month, she led a Buffalo Philharmonic program that had the Sibelius Violin Concerto and Rimsky-Korsakov's Scheherazade with the Symphony No. 1 by the young Shanghai-born composer (and 2009 Curtis Institute graduate) Wang Jie. For a forthcoming Columbus Symphony concert, she starts with Lili Boulanger, and then moves into Mozart and Brahms. Falletta doesn't see conscious bias on the part of orchestras that somehow manage to put together an entire season of programming without a single work by a female composer. "They just don't think of it," she says. "They are intrigued when it's on a program, but it's not the first thing they think of, and most of the music we have by women is contemporary, and that is doubly where-do-we-fit-that-in-the-jigsaw-puzzle? But people are really loving these pieces." Next season, she puzzles out some particularly adventurous programming with the Netherlands Radio Philharmonic and Netherlands Radio Choir in a concert at the Concertgebouw that puts the work of a woman, Unsuk Chin (her Le chant des enfants des étoilesees), alongside Debussy’s Prélude à l’après-midi d’un faune and Andriessen’s Agamemnon. It's a program Falletta calls fiercely contemporary, "and that is what we should do — take risks. We should never underestimate our audiences."